Designing a room for a child can be a real challenge. You need to incorporate different elements of fantasy along with practicality. If you are decorating for a girl then chances are there’s going to be pink involved in the room decorations. Another safe bet is to go with a princess theme.Let’s face it every little girl wants to be a princess. Luckily Disney is there to make your room decorating a little bit easier. The Disney Magic Garden is there to help you with your decorating needs. 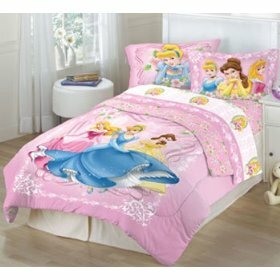 The Disney Magic Garden collection is a bedding set that will make any little girl squeal in delight. 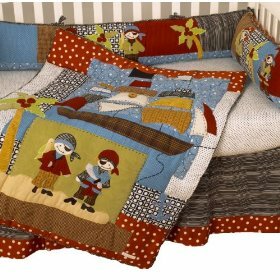 There are quite a few items in this collection that will let you perfectly accent and decorate your child’s bedroom.They include a comforter, twin sheet set, pillow, and pillow case. The Magic Garden collection comes in a perfect little girl pink color with prints of flowers and their favorite Disney princesses. 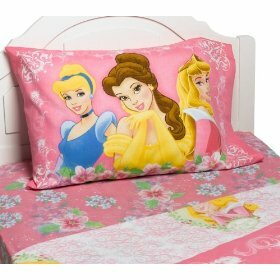 By incorporating a Disney princess motif into a bedroom design you’ll help fuel your little girl’s imagination. She’ll be able to have tea parties with her fellow princesses as well as reenact her favorite cartoons. Anything that can encourage creativity in children is a plus. Like most other children’s sheet sets these are a cotton/poly blend that is machine washable. There’s no need to worry about spills or accidents when you can just toss everything into the washing machine. The fully integrated collection is a huge plus. Disney takes the time and effort to provide high quality products that will draw a room together. You don’t have to worry about mismatching colors and themes with this collection. Every piece accents the other. The bedding collection comes in a standard twin size so it will fit on almost every child’s bed. When we were growing up, the Transformers were huge. Maybe you remember collecting as many toys as you could with my meager allowance. Whether you were more attracted to the Decepticons or the Autobots didn’t matter, you had to have them all. Today, it’s been really fun to see the concept reincarnated. The Transformers really are a multi-generational show. The toys and marketing items that the new movies are producing run the whole gamut from action figures to sheets. This brings us to the Transformer Bedding . Not only will the kid in you like it, but your real kids will love it too. The Transformers are the biggest thing to come along since GI Joe and Star Wars. With the release of the Transformers movie and its sequel coming up it’s a big hit with children these days. Chances are your child is going to want a set of them. So you might as well do your research now. The sheets will make a great Christmas or Birthday gift for your child. Since these sets are generally made for a child’s bedroom they usually come in the twin bedding size, the most common bed size for children. Of course some adults, myself included wish that they came in other sizes, but I guess you have to leave childhood behind sometime. Most bedding made for children is washer and dryer friendly making cleaning it a complete snap. 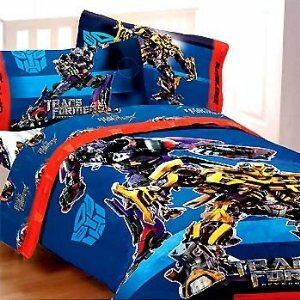 There are also a number of other Transformers Sheet Set designs available that your kids will just love. Every bed needs sheets on it. Of course there are all sorts of options to choose from. You can go from a conservative single tone up through the funkiest print pattern imaginable. Thread count refers to how soft and comfy the sheets are. Again you can go from an institutional low thread count like those found in a hospital or budget hotel, up through ultra soft 1600 thread count sheets. And if your taste runs to animal print designs you can add a touch of class, style, and comfort to your bedroom with this Regal 300 Thread-Count Zebra Print Sheet Set. Thread Count: Thread count is a good indicator of quality. These 300 thread count sheets are a good fit for any home. They provide the soft feel of high quality bedding but at a much lower price. Plus 300 count sheets are durable. You don’t have to worry about them shredding in the washing machine. Zebra Print: Zebra print bedding is a great decorating option. It coordinates well with a variety of room themes and looks great when coordinated with accessories in bright, bold primary colors such as yellow, green and brilliant red. The contrast of a zebra print really makes a bed pop when the comforter or duvet is turned down. 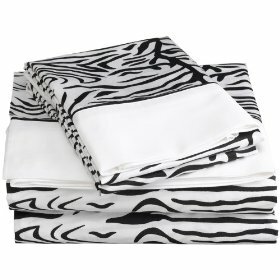 The Zebra print 300-thread count sheet set is made out of 100% cotton so it breathes easy. You won’t be sweltering under the covers on a steamy summer night. Cotton is machine washable too you won’t have to worry about taking the sheet out for cleaning. These sheets are rugged yet soft. They stand up to repeated washings and will last for years to come with out the pattern fading and blending together. The price for this sheet set makes it an affordable way to bring quality and luxury into the house. Most print sets we’ve seen command a much higher price. These are a bargain. 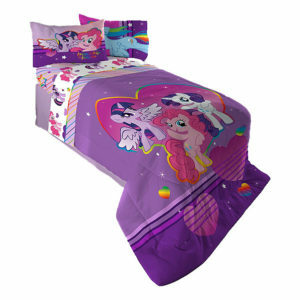 An absolute delight for the younger set is the My Little Pony – Reversible Comforter. Totally appealing to young girls, the My Little Pony Comforter design is in bright purples with the my little pony brigade on the face of the comforter. The comforter fabric is made from 100% soft polyester microfiber which makes it easy to care for, you can simply toss it in the washing machine and the dryer. The My Little Pony Comforter measures 72″ x 86″. So if you are looking for a cute comforter for the young, My Little Pony fan in your family, this comforter is one that you will both fall in love with. She will love the cute ponies and bright colors and you will love the easy care fabric. 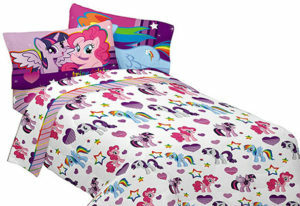 You can coordinate the comforter with the ‘My Little Pony – Sheet Set’ . Featuring ponies in assorted colours on a white background, this sheet set is made from 100% polyester so it is also easy care as it can be both machine washed and popped in the dryer. I found this new Anya duvet set by Le Vele quite by chance and instantly fell in love with the beautiful, vibrant colors. 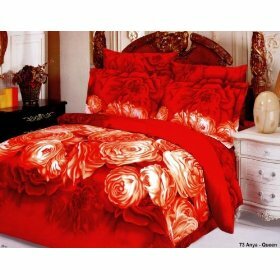 Exquisite European styling lends itself to a bedding set that will add glamor and elegance to your bedroom. The vibrant French design has been printed on the fabric with the latest in reactive dyeing techniques which guarantees that the vibrant color is maintained for many years. The fabric has been woven from high quality fine yarn and has a thread count of 205 and it also has proven antibacterial, antifungal and antistatic properties. The set can be machine washed and tumble dried. This set would make an excellent gift for a housewarming or wedding and it comes packaged in an elegant gift box with a glossy gift bag for gift presentation. The boxed set is also doubled boxed in a brown shipping box ensuring that the package arrives in excellent condition. This beautiful set is unbelievably priced at a low $130. A modern, bright crib bedding set that will look great in the nursery. The comforter and bumper feature a combination of bold prints appliqued with cheeky looking pirates. The black and white fitted crib sheet is made from 100% cotton making it easy to care for as it can simply be popped into the washing machine. 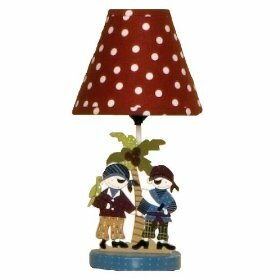 And if you find yourself needing a little extra lighting in the nursery, then why not team the crib set with the cotton Tale Pirates Cove lamp. The red and white polka dot lamp shade matches the red and white polka dot fabric on the comforter and bedskirt. The base features cutouts of the pirates with a palm tree. The lamp takes a 40 watt standard bulb and the shade clips directly onto light bulb. Check out the range of other Pirates Cove Accessories that coordinate beautifully with the Pirates Cove baby crib bedding set. Teens and kids love bright bold funky bedding and that is something that the LittleMissMatched Kooky Flowers Bed in a bag certainly is. This colorful set allows you to toss out all the traditional ideas and fill the bedroom with fun, color and whimsy? Well the Little Mismatched Kooky Flowers Bed Set is the perfect way to do this. Just as the title says, this is a bedding set that is a mish mash of color and creativity that will turn the bed into something that looks more like an art project. From zigzag patterns on one side of the comforter, to bright orange flowers on the other side, and bright green flowers on magenta pillows, this set really is color come to life on the bed! So you can change your bedding look as your mood changes, as each side of the pieces is different so you can flip them around to mix things up. The set is available in twin, full and Queen sizes. 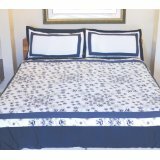 This set is a 230-thread count is made of a 50/50 cotton polyester blend which is machine washable, so it is easy to clean. This is a great unique bedding set that will give you a lot of options for colors and designs. It’s nice to have all the items in one set. Usually to get a mis-matched look you have to purchase all things separately. This way you don’t have to worry about them clashing, as they all work together. If you want to do a whole room in this scheme, there are also other pieces you can purchase to finish the whole decorative set. CLICK HERE to buy the Little MissMatched Kooky Flowers bed set and accessories to give your teenager or youngsters bedroom into a funky modern look. Priced at an incredible $119.99. You can also check out our website for other teen bedding options. 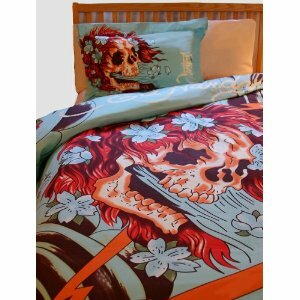 That’s what the design on this Ed Hardy Koi Duvet Set certainly is. 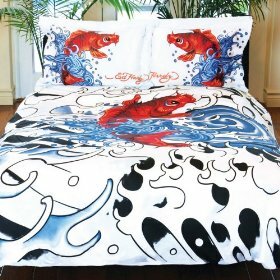 The duvet and shams feature dramatically bold colored, red koi jumping through cascading water on a clean white background. Koi represent good luck and maybe that’s just what this beautiful duvet set will bring you. The dramatic design is created by 12 color screen digital printing. The machine washable duvet set is made from 300 thread count, long staple cotton yarns and the more you wash them the softer they get. The set comes packaged in a beautiful, re usable Ed Hardy decorated box. This set is an Ed Hardy classic and one you will want for your room.